May Bank holiday is when the Gloucester & Warwickshire Railway host their annual steam gala. This year's featured guests included Didcot's King KE11, 70013 Oliver Cromwell, 5197 USA & 6430. The family weekend break happened to coincide with camping in the Cotswolds at a fruit farm very near to the railway. Weather forecast was dire all weekend before we set off. However, once we got down there the family and I spend some time exploring the area on the Saturday, visiting Winchcombe and a National Trust property. It was only late evening after setting up at the campsite, I was able to get the last working of the day, which was in lovely evening sunlight. Waking up the following morning after the storms, we made our plans for the day to visit a local farm owned by a TV presenter. More Thunder and Lightning was forecast, so my planned day at the railway was put on hold. I did manage to get the first northbound passing Hayles Abbey in reasonable light. On our return to the campsite in the evening, the light had become more favourable to get the camera out. So a quick visit saw the Cheltenham Spa head past. Monday itself was probably the worst day weather wise, but I tried my luck and got a couple of ok images before we set off home. Following the announcement by Locomotive Services that the new TOC would go live in 2018, with a limited program and introductory offers. A browse through the tours highlighted a possible contender near my milestone birthday. 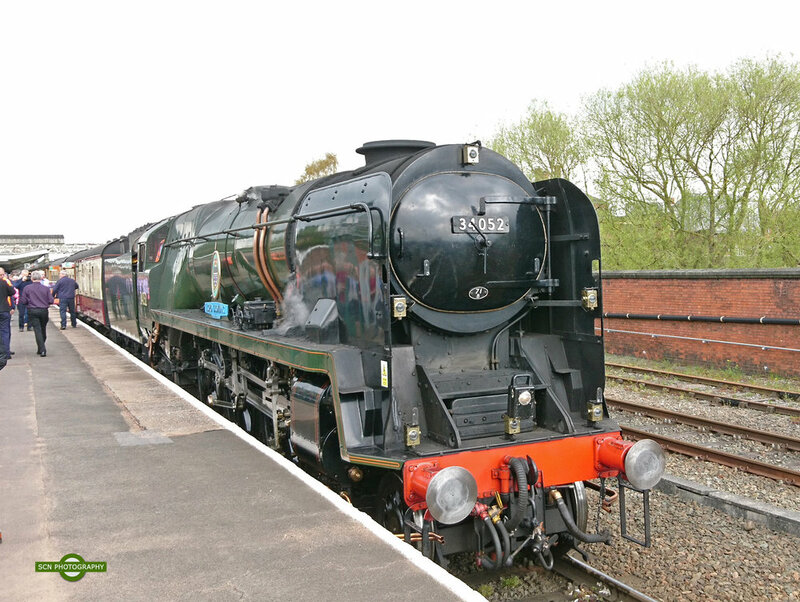 A circular tour of Cheshire, Shropshire and Staffordshire to be steam hauled by one of three possible locos in the pool. Each one I wouldn't mind. Invitation to my parents and wife accepted, tickets duly booked for first class. Upon arrival at our pickup point Crewe and home to our tour operator we awaited the arrival of our train. Scheduled to be 46100, it was a pleasant surprise to find 34052 (34046) hauling the stock. Climbing aboard to a superb MK11, with complimentary Tea / Coffee / Buscuits and Muffins. The whole trip was a success, on time and very enjoyable. The only grip I had was the buffet was advertising wine but none in stock.... If you have it listed on the menu it really should be available. Class 47 D1935 on the rear, looking immaculate. May Bank Holiday was advertised to be the final working weekend for Didcot's King. Due to personal circumstances my planned visit was scheduled for the Sunday. Having checked into Social Media before departing on a few hours drive ahead of me in the morning, everything appeared fine. Indications were that KE11 had been turned to face south, presenting different photographic opportunities from two weeks previously. Weather forecast looked promising for a BH weekend. Upon arrival at Bewdley I joined my father to sit down in the MK1 coach for breakfast. Table service and a fabulous full English, was a good start to the day. With 10:30am looming an expected tender first king was due. To my horror, this had morphed into Taw Valley and my heart sank.....!!! Trying to check social media and other web based outlets proved frustrating - a complete media black out was in full effect it would appear for a few days. I have to say this was a disappointing let down by SVR, given that the loco failed sometime on the Saturday. Plenty of time to let customers know and get the word out. While I fully appreciate failures do occur, the cynic in me thinks that the news was kept back from a revenue point of view. Down at the Valley - 21st April 2018. The GWR blue King was in steam this weekend over at Severn Valley Railway. Appearing courtesy of it's owners Didcot Railway Centre. The King is doing a tour of preserved railways during 2018/9 for the final two years on the current boiler certificate. The day started off perfect, with clear skies. Heading over to Safari Curve, I made my way over towards Foley Park, choosing a spot where the Hi-Vis track gang were out of sight for the 10.25am with the King. What a pleasant surprise to see the loco working with The Intercity headboard and appropriate stock for the loco's livery. Top marks!! It is always nice to see attention to detail such as this. Following the King, 7714 went north with the next service and ex Bullied pacific 34027 working a private driving experience going south. I decided to make my way over to Highley, where I caught up with 34027 again. It was at this point the weather became changeable. April showers caught up and made the departure for 7714, shall we say... atmospheric!! It was also at Highley, I reacquainted myself with 33108, following on from BR, Fragonset and other preserved locations. The final location was Sterns, Hay Bridge at the foot of Erdington bank, in preperation for the King again. At this point the sun was teasing those who were on location.